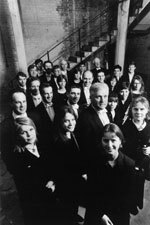 The London Festival Orchestra came into being in 1980 when Ross Pople, then principal cellist with the BBC Symphony Orchestra, gathered some of London's finest musicians to create his own orchestra. Little by little, a few concerts grew into many and, in 1986, Pople left the BBCSO in order to pursue a new full-time career as Director of the London Festival Orchestra. That year the orchestra's first recording on Hyperion (Mendelssohn's String Symphonies) was released and was greeted with outstanding reviews. Throughout its existence the orchestra has demonstrated a remarkable ability to perform with integrity in a great diversity of styles—truly an orchestra for and of our time. The repertoire embraces the very widest range, from the eclectic and contemporary to the Classical and Baroque, from Boccherini and Bach to Tippett and Taverner. It is noted for its innovative concert series: Cathedral Classics is a festival designed to provide sumptuous concerts in evocative cathedral settings throughout Britain and, over the years, has promoted young artists such as Tasmin Little, John Harle, Bryn Terfel and Evelyn Glennie. With coverage on both radio and television and (for the first nine years) unprecedented sponsorship from a single major national company, the Festival flourished into a national institution. Prestigious London concerts included the Remembrance Sunday concert at the Royal Albert Hall in association with a leading charity each year and Birthday Honours at the South Bank, a celebration of composers' birthdays, including the 75th birthday of Sir Malcolm Arnold conducted by Lord Menuhin. The LFO also plays regularly throughout Cumbria in conjunction with a wide-reaching education project for schools in the area. Overseas, the LFO has travelled regularly through Europe, South America and the Far East and has become involved in many fascinating projects including representing Great Britain at the Seoul Olympic Games. The LFO was the first international orchestra to visit Argentina following the Falklands War and the first to appear in Cuba since Castro's ascent to power. It has played in major concert halls throughout Europe including the Berlin Philharmonic and Amsterdam Concertgebouw. Future plans include tours of Ghana, South America and the Far East, as well as further performances throughout Europe. There is of course another vital element in the LFO's existence. In 1990, by selling his prized cello, Pople was able to fund the purchase of two derelict Victorian Warehouses in the heart of London's South Bank to provide a home for the orchestra and a resource for visiting organisations and community groups. It is a beautiful rehearsal, recording and concert venue, incorporating its own orchestral administration offices. By complementing the functions of the buildings with the work of the orchestra, the LFO has been able to thrive as an innovative and exciting organisation without relying on public subsidy.